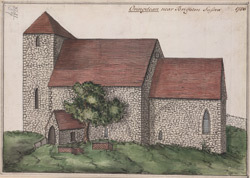 The small, early-Norman church of St Wulfran in Ovingdean, Sussex, has been added to and altered many times. The nave and chancel date from the late 11th century and the tower from the early 13th century. As newer, larger windows were installed, many of the original window casements were blocked up. On the south wall is a blocked up Anglo-Saxon style doorway, which was probably the original entrance to the church.